Not with outer space, but with some old members – here's what they have to say! We are a bunch of ex-members of the University of Bristol Explorers Club who are so sad that we still meet twice a year to renew old acquaintances, go for a walk, (yes, we still can) and enjoy a good meal and weekend together. 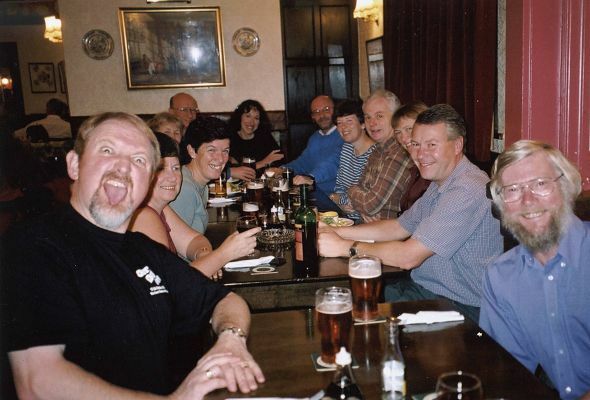 The photo was taken in October 2001 at our latest reunion at the Buck Inn in Malham. Most of us left University in 1974 and 1975, with one or two even earlier than this. We have gone through a phase of expanding in numbers with numerous children and we have now moved to a period where the children are off to University themselves and have better things to do than accompany their parents. Just thought you should be warned that membership of the Explorers Club often leads to marriage and a whole life spent with a fellow member! Many of the party pictured are married to fellow explorers. ...and here's the photo, I'm saying nothing!! We are pleased to announce that congratulations are in order as two of our recent alumni have just got engaged! 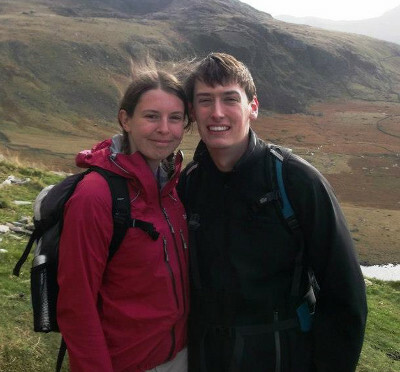 Will and Catie (pictured here on an Explorers walk in Snowdonia) met in Explorers Club in 2011. Are you an ex-Explorer? Do you know how long Henrietta has been the club mascot? Why not get in touch, send us a picture and you too could be put on this page!